Product clearance - huge savings! 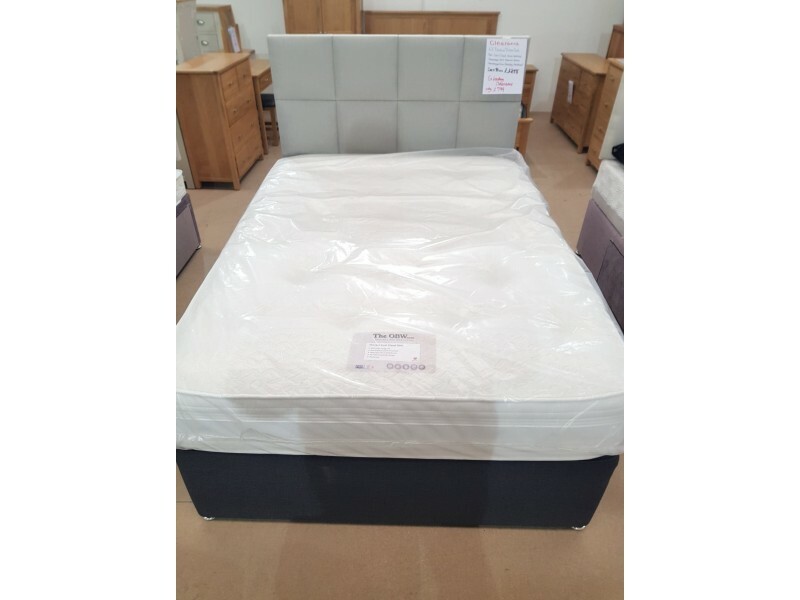 Sleepeezee 4 drawer continental black divan base. Sleepeezee floor standing hemp cube headboard. Gel 2000 mattress. Keeps you cool whilst offering pressure relief. Free delivery & assembly to Poole area. We have put several of our divan sets on clearance to make space for new products. Huge savings to be made! The headboard: 4'6 Sleepeezee floor standing square panel headboard, hemp fabric. Inside the mattress are 2000 responsive pocket springs, with zonal support that helps spinal alignment and aids good posture. Each spring has independent movement to ensure no roll together. A layer of breathable Cool Gel responds to the weight of your body and reduces pressure points, preventing tossing and turning. We have also included our revolutionary zero gravity foam that contours to your body shape, offering fantastic comfort and support where you need it most, helping to relieve sleep related aches and pains and pressure build up. Integrated tencel fibres promote body temperature regulation and help to prevent a feeling of heat, moisture or cold, keeping the body at an optimum 37 degrees. Finished with airflow boarder vents that allow air to circulate keeping the mattress fresh. Flag stitched side handle aid easy positioning. 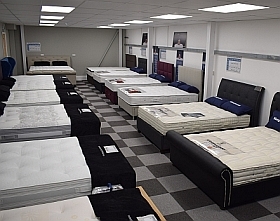 Gel mattresses are very effective at combating overheating due to its extremely breathable properties. If you like the feel of a memory foam but have concerns around getting too hot, then a Gel mattress is the answer for you. The base: Sleepeezee 4'6 four continental drawers, black. Now £799 including delivery & assembly to Poole area! Our store is situated in Poole, Dorset but our website has been set up to allow anyone to purchase! We have tried to keep the delivery process as simple as possible, so here’s a quick run through on what we can do. All deliveries are FREE but timescales are dependent on products. Our “in store only” category will show you all the products that are available to take home with you or have delivered the same day (if you live within 20 miles). You can visit our showroom to try these out. The rest of our website categories will show you the delivery lead times on each product. These products can be found in the first tab on the header of the website. Many are unique to the OBW in Poole, Dorset and are in stock in store. This means we’re able to offer same day delivery or your day of choice if you live within 20 miles of our store. All products will be delivered to your room of choice. Purchase any next day delivery product before 1pm and we can deliver the next day. If you do not want next day you will need to let us know at the time of ordering. All next day deliveries are via a 1 man service to the front door of your property. Please note, if you are purchasing a next day delivery product with a longer lead time product, the timescales are independent to the product. Next day deliveries run from 8am - 6pm. We will contact you within 48 working hours to arrange a suitable day of delivery for any orders placed for products with the above advertised lead time. Please give us a call if you are unsure about any of our delivery information on 01202 696969.